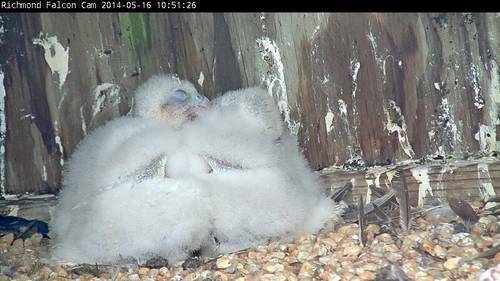 Today the two nestlings are 16 days old, and they continue to grow in size at a fast clip. Flight feathers along the edges of the wings are now visible. 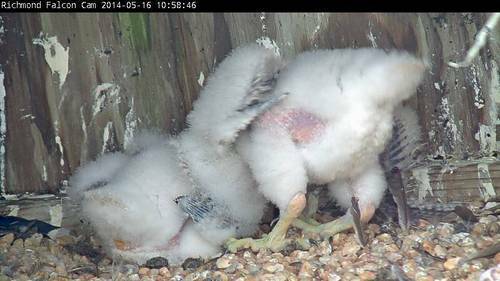 Although brooding by the parents has ceased, the chicks continue to huddle together, which allows them to conserve heat on cool, overcast days such as today. As the chicks become more mobile and better able to stand they may eventually amble out of the nest box to explore their surroundings, which we anticipate will take place sometime within the next week. The female remains close by in order to guard her young, and at this stage still roosts at the nest box. Although the male is still the primary hunter, it is the female that most often feeds the young. As the nesting season progresses, you’ll notice that the nest box becomes increasingly messier. Whitewash from the chicks stains the walls, and prey remains that include feathers and body parts continue to accumulate. The prey base in this area is plentiful, with the urban setting providing an ample supply of pigeons and starlings, and the proximity to the James River allowing for forays after other medium-sized birds such as yellow-billed cuckoos, the remains of which have been observed at the nest box over the years. 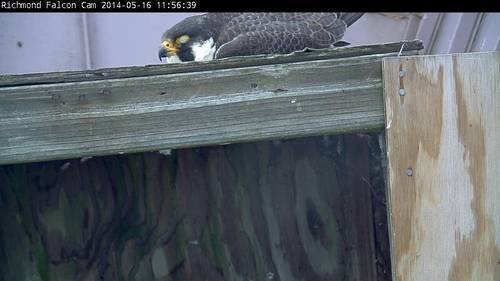 As you may imagine, the nest box does have what may be considered an unpleasant odor to it, but the falcons are unaffected by this. We do not have data specific to how peregrine falcons use smell in their daily routines. However, the long-held belief that birds generally have a poorly-developed sense of smell is increasingly being turned on its head.